Two young adults with open hearts met a young girl with need and the result can be seen in this week’s story about Liana Givargizova. Sometimes the story behind the story is worth telling. This is that story . . .
Three years ago a Swiss-Armenian, Vicken Cheterian, had the notion to start a journalism/international studies school in Yerevan. The Swiss government thought it a good idea and put up the money and Vicken and his colleagues started the Caucasus Media Institute. 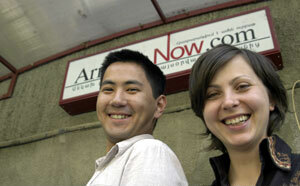 Two years ago a Brit and a Yank had an idea to start ArmeniaNow. Some Diaspora donors thought it a good idea and sent start-up money. The folks at CMI thought it a good enough notion that they allowed us to use their newsroom for two weeks to launch this project, while we hunted for office space. One year, or a little more ago, ArmeniaNow started a collaboration with CMI by which the CMI journalists-in-training can do internships in our newsroom. Several months ago, Yulia Kirnitski and Janar Amankulov started CMI’s training program and became interns with ArmeniaNow. Part of the CMI training included a seminar on ethnology. At the seminar Janar met an Armenian psychiatrist who works in a hospital for cancer patients. Janar asked if he could visit. The young photojournalist took his camera, and through its lens appeared Liana, 10 years old and fragile from the disease trying to kill her. Janar asked if he could do a story about Liana. I told him it would have to be done with sensitivity. Turns out he didn’t need any training for that part. He asked his classmate, Yulia, to help with the story. Yulia, 23, is a Romanian from Kishinau, Moldova. Janar, 21, is from Bishkek, Kyrgyzstan. Neither had been in Armenia prior to their journalism training. Yulia and Janar went to the village where Liana’s family lives. They remember it as an emotionally difficult day. Consider the scene in that village of Upper Dvin: An Assyrian-Armenian family hosting a Kyrgyz and a Romanian from Moldova, all joined by the chance of ideas formed by three other outsiders. From that meeting, to your computer screen, comes the story of a child whose life, we hope, will be made better by the collision of several fates. We don’t go looking for stories like Liana, but when we find them, we think you ought to know about them. If you want to help, we can make that possible. Write to us: info@armenianow.com. In the coming weeks, we’ll be asking readers to become supporters of the project ( New Times Journalism Training Center) that produces ArmeniaNow. We hope you’ll respond. And we hope our work will continue to help others. If even in the most unexpected ways.